Guess who hasn’t done a WIAW in a few weeks? Let’s change that up. Oatmeal. Except not really. I ran out of oatmeal. 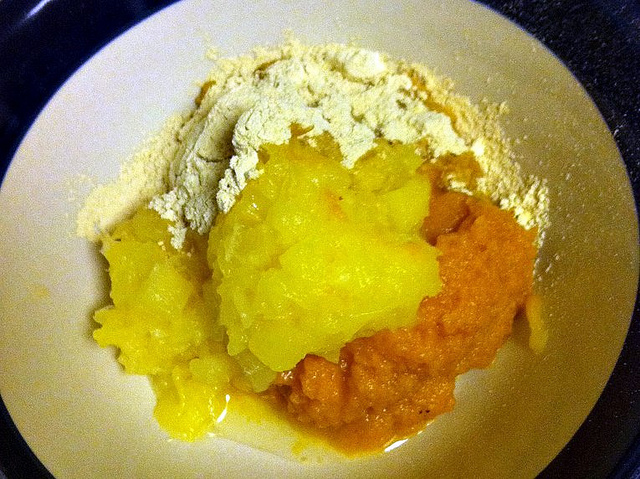 So I ate what planned to put in my oatmeal–pumpkin puree, pineapple and protein powder (holy cow, “P” party)–without the oats. As good? No. But it was 4:30 am. Shrimp cocktail. Except (clearly) not really. 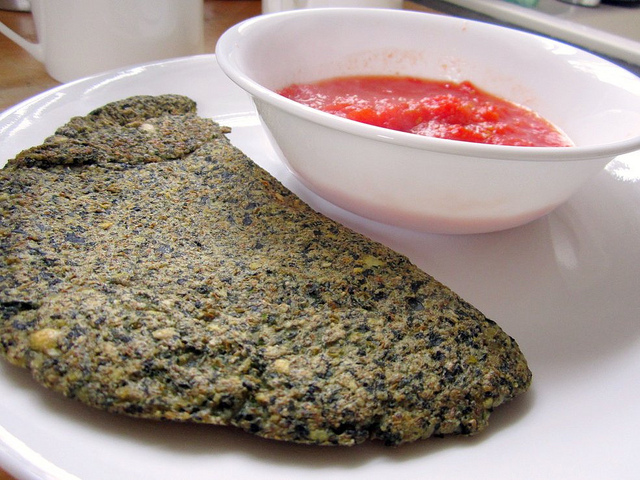 This lentil flatbread with wakame blended in for seafood flavor and cocktail sauce (tomato puree + horseradish) for dunking. Burgers. Except not really. 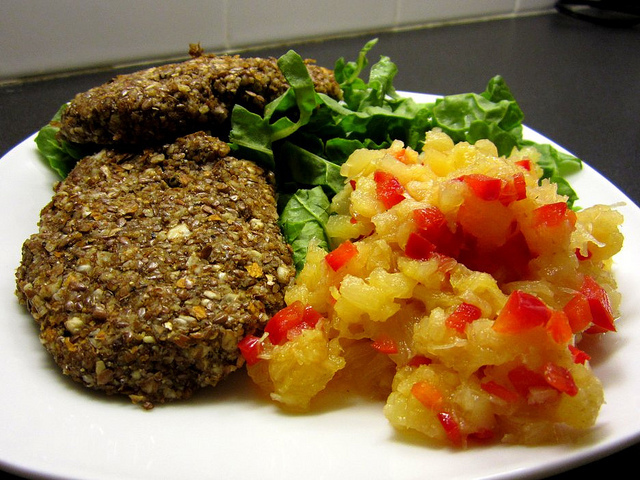 A raw meal of almond and flax patties from the Thrive cookbook with a side of pineapple salsa. I know I promised yesterday that I’m not going raw–but just look! Yum! What’s your favorite meal or product that mocks an existing thing? The pineapple salsa sounds delish. I guess my “mock” meal would be just any meat substitute like Sunshine burger patties or tempeh bacon. Mmm, tempeh bacon. That needs to make a reappearance in my life. The pineapple salsa sounds lovely. But I have to admit that I would probably just have eaten toast for breakfast. Ha! Have fun house-sitting. I like to mock my dog and siblings on a regular basis…with love, though, with love. I also like black bean burgers. I own the thrive cookbook, I love the thrive cookbook, heck I pre-ordered it. But I think I’ve only ever made one or two recipes from it. I think I need to do a What I Ate roundup from time to time so I can feel like I can post dishes other people developed. I’d love to see a round up of yours! As much as I love all the original(ish) recipes out there on the Internet, I also like seeing what cookbooks people own/what recipes they are trying and so on. And THANK YOU for the mock tuna reminder! I’ve wanted to make your recipe for ages–bumping it up on the endless recipes-I’ve-saved list. Love those veggie patties + pineapple salsa!! You eat breakfast at 4:30 am??? wow…I’m impressed! I’d never think to move forward with my breakfast minus the oats but you made it look good!! Yumm yum the pineapple salsa sounds wonderful 🙂 And goodness you wake up really freakin early woman! I was thinking the same thing, breakfast at 4:30? You’re on it! I didn’t get up until 7 today, but I do have a sore throat, does that count. I do make ‘oatmeal’ without the oats sometimes too. Just liquid eggs, pumpkin, banana, ground flax and a nut butter. Still delicious. That pineapple salsa sounds delicious! And your breakfast sounds really good, I never would have thought to continue to make oatmeal without the actual oats haha! Desperate times, haha. I had NO other food in the house, so it was experiment or go hungry. And I am not one to go hungry. Pineapple salsa? YUM!!!! Have a great time in the boonies! Nothing wrong with some quiet time!!! I eat mock meals all the time. You just manage to make it look good! Enjoy your time in solace! Wow breakfast at 4:30, so early! My favorite mock meal would be spaghetti squash. I have yet to try spaghetti squash–I have a feeling I’m missing out on something amazing. Haha, you WOULD mock foods all day long! Too funny. I love your “mick” meals. And I’m totally busting out the crock pot tomorrow – so excited! Your meals look quite tasty. What a great Wednesday! please teach me how to cook like this? I loooove vegan chili! does that count?? These are super adorable “meals” 🙂 I’m in! Beef-less BBQ shreds! So delicious! Forget ‘mock’, I think your eats look amazing in their own right! Totally delicious! I’ve never had a raw burger and I can’t wait to give them a try now I’ve seen how yummy they look!